I’m sure most of you use the word “minted” as a synonym for “cool,” “ace,” “hip,” etc. E.g. “That car is well minted bruv.” But I must advise you that this recipe title is in fact referring to the common herb, mint, and not urban speak. The first thing to say about this recipe is that you’d have to be nuts to grate onion. Honestly, what was she thinking? I cried for hours, just wept at the sheer futility of it all. Just chop it very finely by hand or in the food processor and then get rid of the excess liquid. In fact, everything could go in the food processor quite nicely – onion, lamb mince, garlic, raisins (absolutely genius addition), spices, fresh mint and coriander, egg and breadcrumbs. Mix it all together and form into 4 burgers. Fry the burgers for a couple of minutes on each side and then finish them off in the oven for 10-15 mins. Meanwhile you have to make the cucumber yoghurt. To be honest, you might as well buy tzatziki from the supermarket. The burgers are the star of this meal, so don’t bother yourself peeling and de-seeding a cucumber. It’s not worth it. 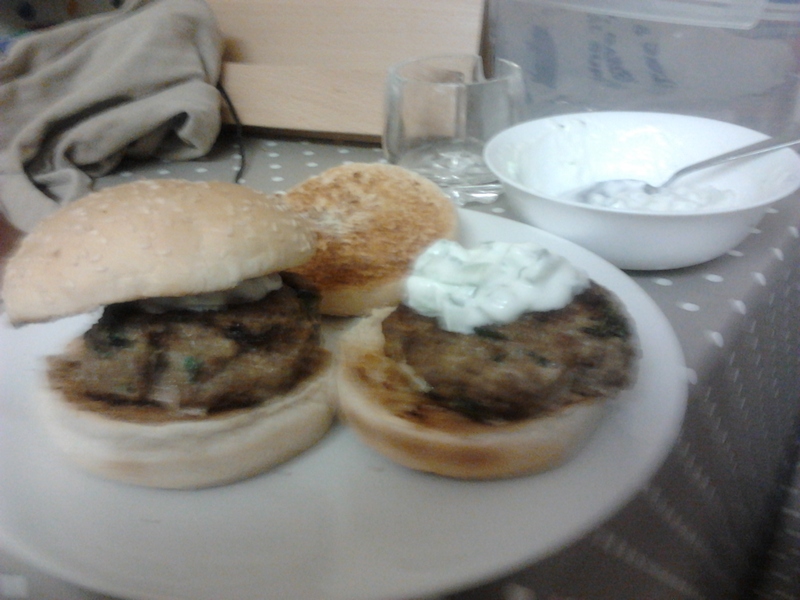 Serve the burgers in toasted baps with a dollop of the tzatziki with some added mint. They’re pretty filling, so I just served them with a salad, but hungry men may want chips! The balance of flavours in the burgers is lovely – especially the sweetness of the raisins with the lamb. Definitely make again for a summer bbq.